This reference site consists of images and descriptions of Octopus Spring in Yellowstone National Park. 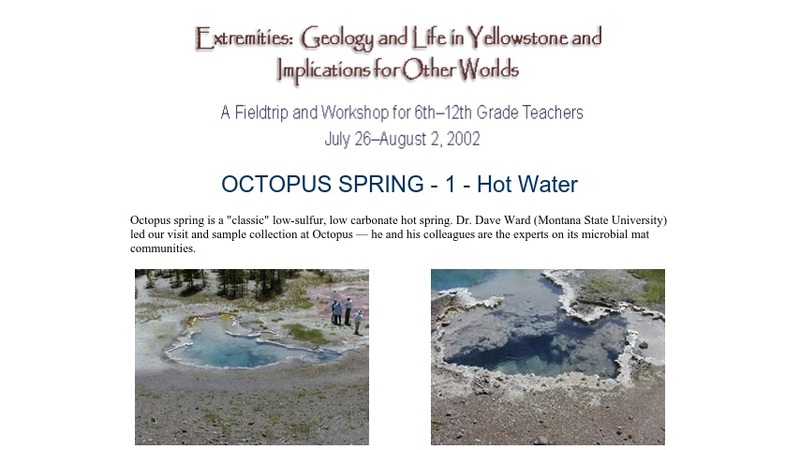 Part of the teacher workshop "Extremities: Geology and Life in Yellowstone and Implications for Other Worlds," it describes both the cool water and hot water habitats of the spring. Sampling techniques are included with a description of the microbial mat community. The images and descriptions cover three web pages, each of which can be accessed through links at the base of the pages.